“We never want to delete any negative reviews,” says Ashley Tyson, social media manager at 4Food. In fact, 4Food streams all @-mentions on a 240-square-foot media wall inside the restaurant. “Nobody expects a restaurant to always be perfect, but an honest response and quick offer to resolve the situation is what differentiates a good restaurant from a bad one.” Above, you’ll see that when Judy complained about a wrong order at her local Jimmy John’s, the company showed initiative and replied with an email address and a willingness to work hard to regain trust. 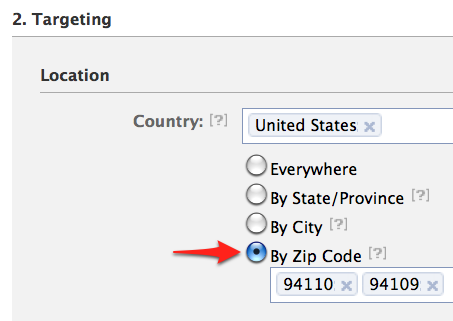 You want to engage your fans on your Facebook Page, but you also want them to know that you are engaged, too. 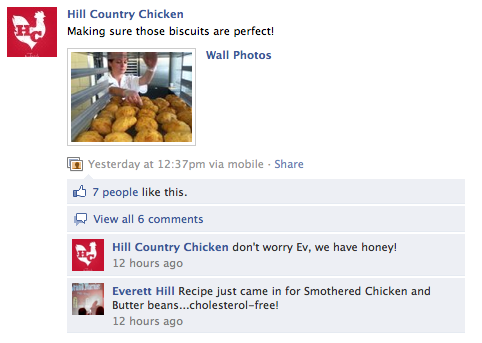 Be sure to answer questions, address concerns, and acknowledge when people take the time to post on your Page. Even if it’s just a thank you for a nice remark, be sure to respond to your fans. “Never underestimate how far the words ‘thank you’ can go,” says Amanda Spurlock, Zagat’s social media editor. Restaurants have a unique opportunity — they can showcase the food, provide recipes, explain the origin of a dish and shoot videos of the chefs in action. That kind of content never gets old, and it doesn’t even have to be original — there’s so much stuff on YouTube, and all you need to do is unearth it. The Mermaid Inn posted this how-to video on its Facebook Page to show fans how to cook and eat lobster — an item they sell, so it’s related to the restaurant but also adds value. Tyson says that because 4food receives new shipments of fresh produce and product every day, she likes to “use social media to educate our followers on fresh shipments, how we prepare our food (from scratch, with no artificial ingredients or fillers), where it comes from, etc.” She adds that as the locavore and sustainability movements gain steam, consumers are more interested in this angle than ever before. “People want to know they’re eating the freshest, tastiest and most healthful product possible,” Tyson says. Yes, your restaurant is a business, and your goal is to make profit. 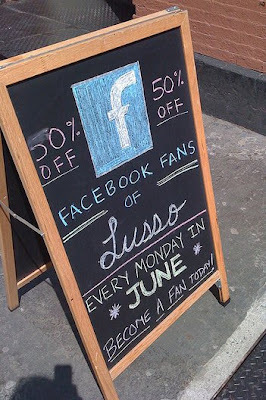 But you don’t have to do the hard sell on Facebook — oftentimes restaurants are overly promotional. “While consumers love to hear about new menu items and special offers, they don’t want to interact with anyone that appears too self serving,” says Tyson. Think about your brand and then try to find the right mix of promotions and special offers, education, customer service, engagement, etc. Use a diverse set of content to establish and build your brand. On National Oyster Day (who knew that existed? ), Island Creek Oyster Bar posted a YouTube video — it’s a soft sell that doesn’t desperately scream “Come eat here!” yet still plants the seed that could get consumers to crave oysters. Sharing fun facts pertaining to your cuisine or the team is also a fun way to get people excited about your food, and it humanizes the brand. Another way to promote your brand is to let others do it for you. After all, word of mouth marketing is the most effective (and authentic). Stupp recommends that you motivate your customers to become ambassadors by treating them well, listening to them, talking to them, informing them and being interesting and engaging. Once you do that, your loyal fans will spread the word for you (for free!) online and in real life. You’ve worked hard to get good reviews and spur people to write blog posts about your food. Go ahead and share it with the world. This goes in tandem with avoiding the hard sell — by being awesome, you’ll motivate people to spread the word. More publicity means more customers, and it will snowball as long as your product is delicious and your customer service remains excellent. Chicago eatery Graham Elliot is great at posting press, which shows that the restaurant gets a lot of press, and also serves to brag about the cool things they do, like hosting a pop-up restaurant at this year’s Lollapalooza music festival. A small percentage of restaurants are on social platforms and seeing success. Jimmy John’s, the Midwest sandwich chain, is one of them. Not only do they have an iPhone app for ordering, but it’s also their Facebook profile picture, which is a great way to increase awareness of said app. At the very least, be active on Twitter and Facebook, and it’s also great to have a blog or an app. And all of these things should be promoted on your Facebook Page, like the Jimmy John’s company blog. Be sure that your community managers are “as well-versed in your restaurant food and service and intangibles as your best employees in the field,” says Stupp. 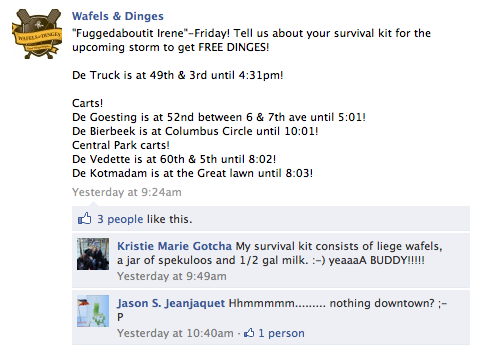 You don’t want people to get answers on Facebook and hear a different story when they show up for dinner. It can be hard to maintain seamless communication — especially if there are different locations that may have different offerings or hours, but it’s important to stay in the loop and make sure that the information put out by your restaurant is accurate and consistent across all platforms, whether they be social platforms or in-person. Being inconsistent will lead to confusion and frustration for your customers, who may feel like they were promised one thing, only to be told something else upon arrival. Whereas a bike store or car dealership are typically single-purchase businesses (how many bikes and cars does one person need? ), restaurants are in a unique position in that someone could be a customer every single day. And while group deals and offering discounts might be good for a one-time promotion to increase Likes, you don’t want to give too much away. The NBC Facebook and Chipotle promotion for a buy one, get one free burrito was a huge success that got a lot of people buzzing and in the shops, but the business didn’t have to lose too much money on it, because for every free burrito, there was a paid burrito. Just giving away product or offering steep discounts a la Groupon can have detrimental effect on the perceived value of your product, thereby making customers less likely to want to pay full price once the deal is over. Experiment with different times and codes to discover when people are more inclined to be driven to your store by social media, says Tyson. You want to use Facebook to enhance traffic and sales, but to do so most effectively, you have to know when people are paying the most attention to you. If you’re looking to build loyalty and Likes and keep people coming back, don’t just give away product. The best thing to do is respond to people, talk to them like they’re your friends and show your appreciation for them. To customers, that’s worth more than a free sandwich. Work can be stressful, so when someone sneaks away from the office for lunch or dinner, they want to be delighted. Whether you’re a quick sandwich lunch stop or a white-tablecloth establishment, you can be charming and human. 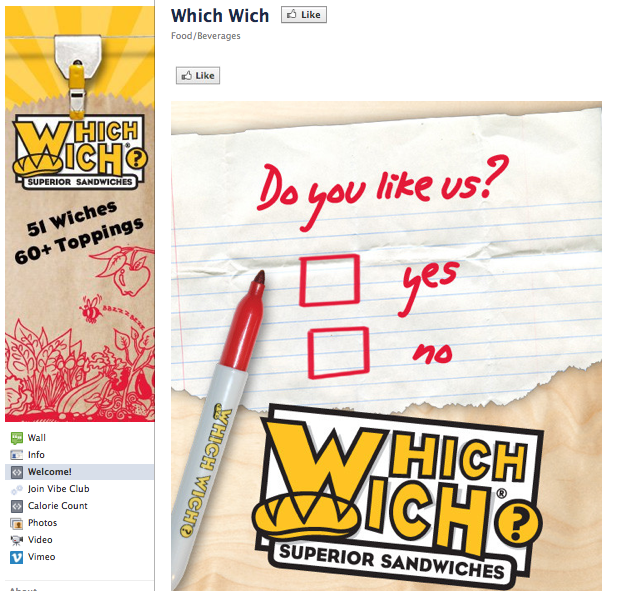 Which Wich, a sandwich chain, literally flirts with its customers on Facebook, presenting a Like-gate that’s modeled after a middle school-esque “Do you like me? Check one. Yes/No” note. We know there’s a human behind your Facebook Page, so you don’t need to stifle him — let a genuine voice come through. However, sometimes people write about not-so-positive experiences, and that can be a trickier situation to manage. “If someone complains about a particular individual or restaurant prior to an objective investigation, take the correspondence off the wall but make sure you let the customer know this and why you are doing it,” says Stupp, adding that your team has a “right to fair treatment” and should not “be guilty in the eyes of the public until proven innocent.” Be sure you resolve any issues, apologize for the perceived wrongdoing and let the customer know what steps have been taken to remedy the situation — follow-through is key if you’re trying to get that customer back in the door. Sure, it’s easy to automatically syndicate your Twitter posts to Facebook and vice versa, but is it a good idea? No. “You have to think of Facebook as it’s own platform,” says Spurlock. Just consider the 140-character limit on Twitter. That means Twitter-to-Facebook posts will be extremely short (and photos and links won’t show up like they do when you post directly to Facebook), and Facebook-to-Twitter posts will likely get cut off and people may be annoyed that they have to go to Facebook. Variety is the spice of life, and food establishments should know that.